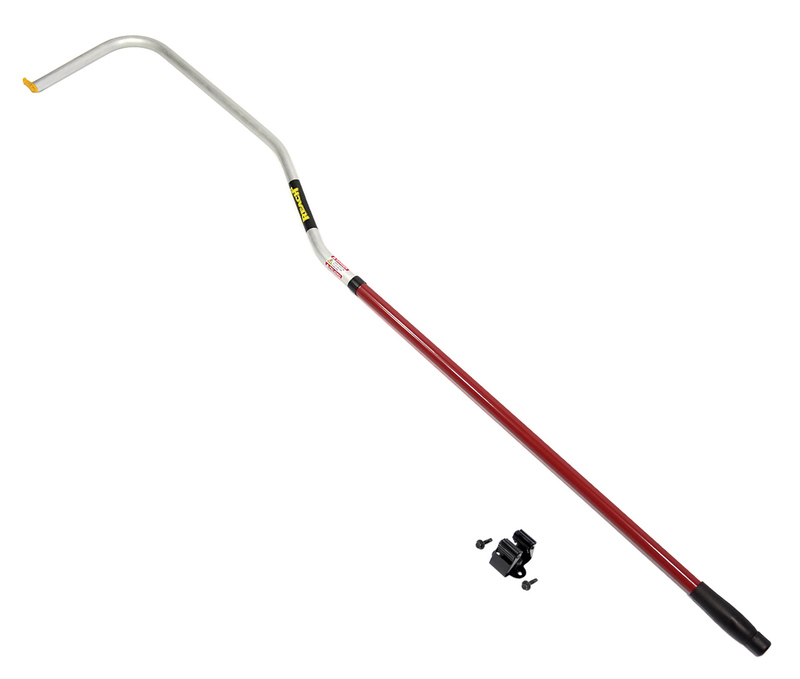 The DU-Hooky is an extendable reaching tool made for retrieving items from pickup truck beds and reaching items around the house and shop. Instead of climbing into your truck bed, stand behind your tailgate and reach any items that have slid too far forward using the DU-Hooky. For photos and more information, scroll down towards the bottom of the page. • Unlimited uses – Works great for anything you can’t quite reach! • Will easily handle objects over 100 lbs. Dimensions: L 58" x W 11" x 2" H (not extended). Includes a 1 year warranty on the DU-Hooky and a lifetime warranty on the yellow tip. The DU-Hooky works great for unloading all your camping gear from your truck bed. The DU-Hooky comes in handy around the house. Use it to hang flower baskets or bird feeders. Perfect for farm use! The set screw on the yellow tip allows you to loosen and re-position the tip at different angles. By turning the tip 180 degrees, it makes a good hook for retrieving duck decoys and lines. Perfect for loading and... ...unloading your truck bed! Works great for sweeping out your truck bed. The DU-Hooky tip slides in the grooves of pickup beds and bedliners allowing you to get underneath and hook items. The tip is extremely effective at hooking into cardboard and catching the plastic lips on the bottom of buckets. Slide the tip under the item you wish to retrieve, then turn the DU-Hooky to the side, so the tip can 'hook' onto the bottom of your item, then pull the DU-Hooky and your item towards you. Mounting clip and hardware is included. Installation is easy! Use the two included screws and attach the metal clip to a convenient location in your pickup truck bed. We recommend placing the clip so the DU-Hooky rests over the wheel well and is easy to access while standing beside or behind your tailgate. Close up of mounting clip attached and DU-Hooky installed. The end of the handle screws off to reveal a threaded connector. This is designed for attaching the scraper. It also works great for attaching a paint roller, squeegee, duster, or any other standard item that has a female connector. Great for loading and unloading! The DU-Hooky allows you to arrange individual items and push them to the front making efficient use of your cargo space. The tip of the DU-Hooky slides in the grooves of pickup beds and bedliners allowing you to get underneath and hook items. It is extremely effective at hooking into cardboard and catching the plastic lips on the bottom of buckets. The set screw allows you to loosen the tip and re-position it at different angles. 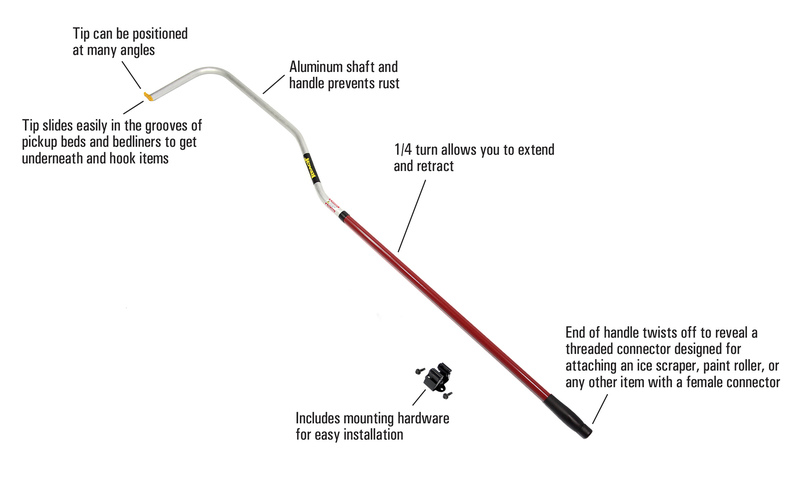 • Turned sideways or in its original position, it works great for hanging holiday lights on houses and trees. • Turned 180 degrees, it makes a good hook for retrieving duck decoys and lines. The end of the handle screws off to reveal a threaded connector. This is designed for attaching an ice scraper. It also works great for attaching a paint roller, squeegee, duster, or any other standard item that has a female connector. Simply bolt the metal clip to a convenient location in the bed of your pickup truck. You can also secure the clip to a wall in your shop or garage to keep the DU-Hooky within reach at all times. Can also be used for cleaning rain gutters, retrieving duck decoys, landing boats, and anything else you can't quite reach.